Recycle My Windshield, is a sustainable solution for the environmental problem of damaged windshields and building glass. There is over 300 million vehicles in North America, all with laminated glass windshields. It's been estimated over 5% of windshields are damaged annually, with the vast majority of them destined to live in landfills. Through the patented processes of Shark Solutions, Recycle My Windshield provides a sustainable answer, for the recycling of both the glass and PVB interlayer of the damaged laminated glass. These recycled and reprocessed materials are given a new life as a part of environmentally friendly products. Companies from across North America have expressed their desire to reduce landfills and lower greenhouse gas emissions - are you ready to be part of this sustainable solution? To learn how your business can become part of this solution, contact us at info@recyclemywindshield.com, or call us at 706.356.5074. A windshield normally consists of a layer of PVB (PolyVinyl Butyral) which is sandwiched between two sheets of glass. During the manufacturing process, air is removed and heat is used to bind the windshield together. 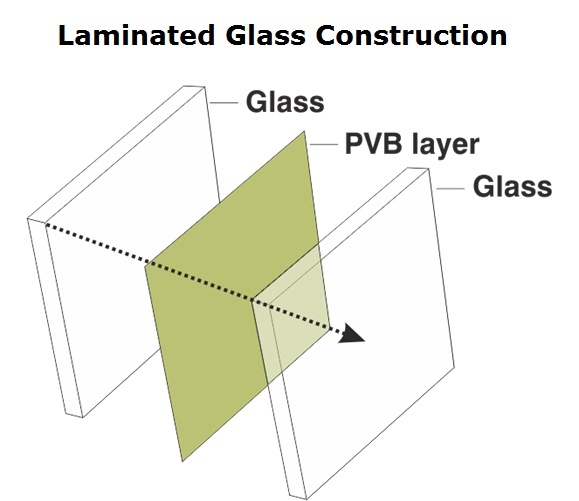 It is during this process that the PVB becomes transparent in the windshield. PVB is the binder that holds the windshield together in an accident, and it is also what makes the recycling of windshields difficult. The patented processes we utilize solve this problem.